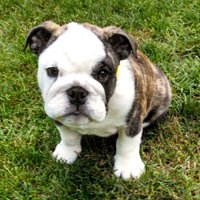 A comprehensive foundation of in-home obedience & behavior modification, plus Socializing Groups. 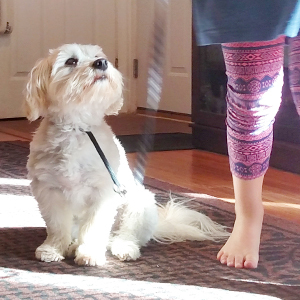 One of our Behavior Consultants will spend five sessions working with you and your family at home teaching your dog basic obedience on leash so you can fluently communicate with your dog in everyday situations. 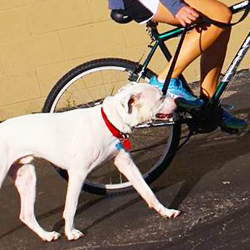 We'll also provide you the knowledge and proper methods to solve and prevent behavior problems, focus on your specific training goals, and begin teaching advanced obedience techniques where appropriate. After the in-home sessions, you and your dog will be ready to attend our weekly Socializing Groups where we apply what you have learned at home to begin teaching your dog how to behave in a social setting. 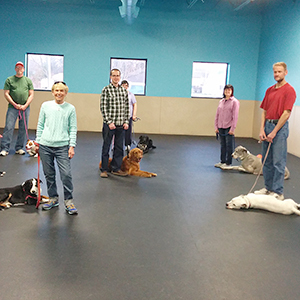 We strongly encourage you continue attending as many weekly Socializing Groups as possible to finish your dog's training, building their confidence outside of the home. These sessions are available to you for another year after the in-home portion. If you need any help with something we had worked on in-home at a later time, we will re-visit your home at no additional charge. Our primary goal is to help you effectively modify your dog's behavior, and there's no set amount of time for that. Required for severe behavior issues (additonal in-home or private sessions may be required at a per session rate). Foundation program for service dog work. Socializing Groups are available to clients after the first year at a per session rate. Just right for the in-home basics. 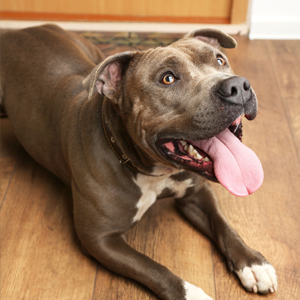 Our Basic Program is great for learning basic obedience and addressing common behavior issues such as jumping, destructive chewing, housebreaking and more. One of our Behavior Consultants will spend 3 sessions working with you and your family at home teaching your dog to COME, SIT, HEEL, DOWN, SIT-STAY, DOWN-STAY and more on leash while focusing on current behaviors. We'll also provide advice on how to prevent future behavior issues. For dogs who already have a foundation in basic obedience, we can focus this program on advanced and off-leash techniques. Start off on the right paw. Early learning and socialization is very important, and we highly encourage puppies under 6 months old to attend our Puppy Pre K-9 class. Our Train While You're Away program can also help with midday energy outlets and potty breaks. We can help even more at home by teaching your family the basics of puppy raising, how to properly manage and prevent behavior issues from developing, and begin early training techniques to help you and your puppy communicate. We'll spend two hours covering information and showing you how to begin teaching basic commands. When your puppy is mature enough to begin in-home training, we'll apply your Puppy Jumpstart tuition towards your next in-home training program. Our per session rate is a good option for advanced techniques or help with a specific issue such as loose leash walking, treadmill training, advice on a newer behavior issue, introducing a new dog, and more. We also offer discounted in-home hourly and class rates to local 501(c)(3) dog rescues for temperament evaluations, home introductions and foster home education. We also provide a discounted rate on our training programs for dogs in foster homes, and add a bonus 'Adoption Session' to help transition them to their forever home. Rescue rates available for dogs within the legal care (pre-adoption) of a registered 501(c)(3) nonprofit rescue organization. Not a substitute for foundational training. 'Adoption Session' included in rescue programs only applicable to adopting homes within our service area.